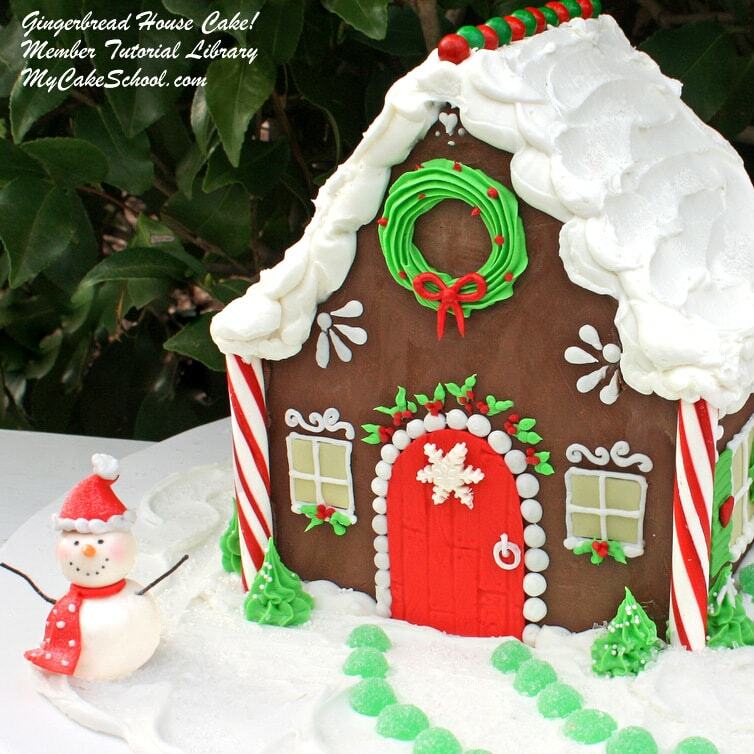 Mmmmmmmm….there’s just nothing better than scratch Gingerbread Cake for the holidays! Now that fall has arrived, my cravings for all things cozy and spiced are in full swing! Are you having those cozy cravings too? 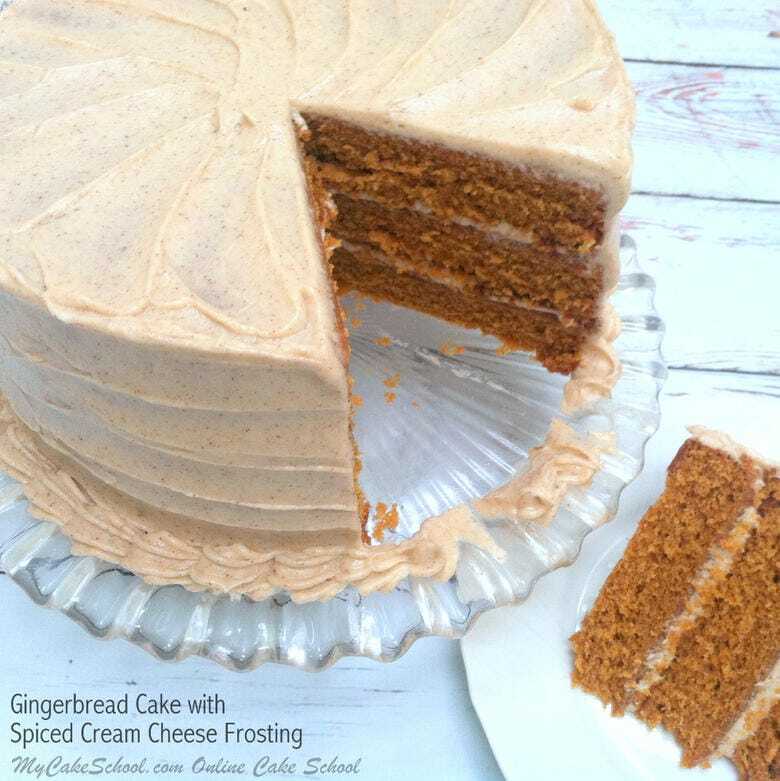 I think you’re going to LOVE today’s scratch recipe for Gingerbread Cake with Spiced Cream Cheese Frosting!! 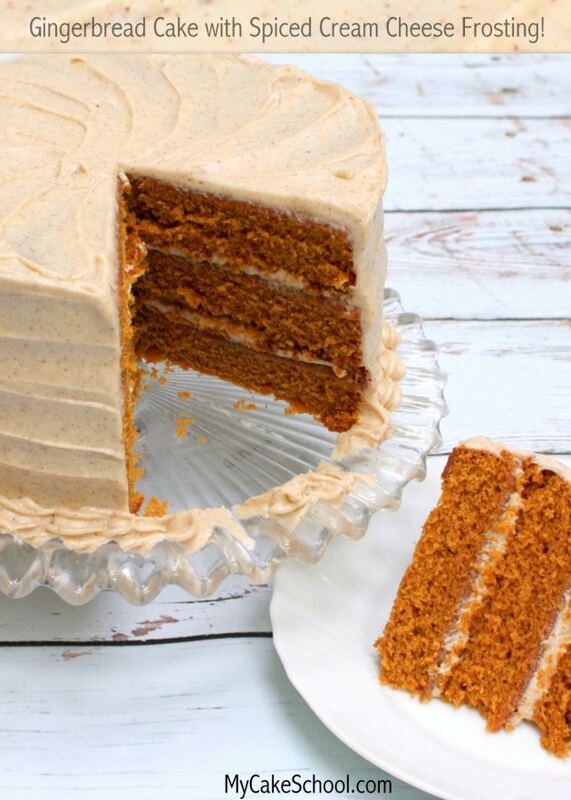 This gingerbread layer cake recipe is amazingly moist, flavorful and delicious. The spiced aroma that will fill your kitchen is almost reason enough to bake the cake! Ahhhhh…. Before we made this recipe, I had always associated gingerbread with cookies or a holiday treat, but not an actual spiced gingerbread layer cake. I didn’t realize what I was missing! 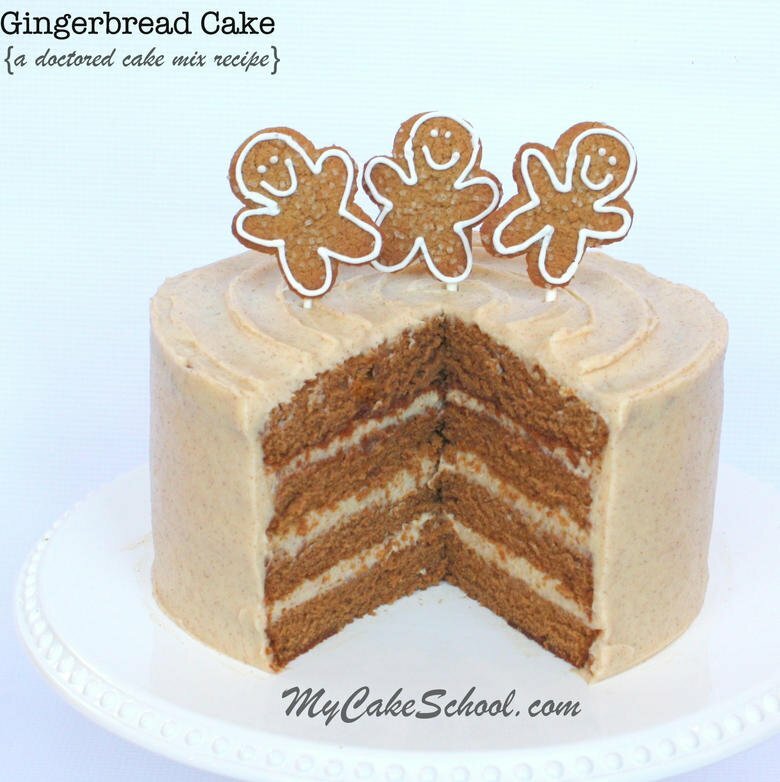 What I love about this dessert is that it incorporates all of the flavors of gingerbread into fluffy cake layers. The Spiced Cream Cheese filling and frosting pair beautifully with the gingerbread cake layers. It’s a match made in heaven. This is a welcome dessert at my house year-round, but I especially love it for Thanksgiving and Christmas, when our cravings for spiced deliciousness are at their highest! YUM! We hope that you enjoy this fabulous scratch recipe! Looking for an easy and delicious Doctored Gingerbread Cake Mix Recipe? Do you prefer to work with doctored cake mixes? If so, you are in luck. We have an amazing Gingerbread Cake (Doctored Cake Mix) Recipe also! Moist, fluffy, and DELICIOUS cake layers with the perfect blend of spices! This recipe works wonderfully with cupcakes too! Thanks for stopping by our site! We hope that you enjoy the recipe! Make sure to stop by our Recipes Section for our full collection of tried and true cake and frosting recipes! Our Collection of FAVORITE Cake and Frosting Recipes! Grease and flour three 8 inch pans, add a circle of waxed or parchment paper to the bottom of each pan. In a separate bowl, combine flour, ginger, cinnamon, nutmeg, baking powder, baking soda and salt. Whisk at least 30 seconds. Set aside. In another bowl, add the hot water, oil and molasses. Stir and set aside. Do not mix the ingredients above medium speed. In the bowl of your mixer, beat the butter until smooth. Add the sugar and mix 4 to 5 minutes until lightened in color and fluffy. Add the eggs one at a time mixing just until the yolk is blended in. Add the flour mixture to the butter mixture alternately with the wet ingredients. Begin and end with the flour mixture (3 additions of dry ingredients and 2 of wet ingredients). Mix until just blended in, scraping the bowl a couple of times. Do not over mix. Divide evenly between your three 8 inch pans. Bake at 350 degrees for 22 to 25 minutes or until a toothpick inserted in the center comes out clean or with just a few crumbs attached. Using your mixer beat the butter and cream cheese until well blended. Add the and spices. With the mixer on low speed gradually add the confectioners’ sugar and mix until it is a good piping consistency. Hello Melissa & BeBe! There are 2 spiced cream cheese frosting recipes. Do you have a preferred one over the other or does one make more than the other? As always, thank you for all your delicious recipes! Hi GuppyLove, We like both of the recipes, the other recipe, here is a link link to mycakeschool.com is less sweet with only 3 cups of powdered sugar. It is also better for piping. I forgot to measure but I think both recipe make about the same amount……enough to fill and frost a 3 layer 8 inch cake. This is definitely my new favourite cake recipe. Thanks Bebe for posting! Hi, i like your recipe. Like always. Only i wonder why one time 1 tsp is just 1 gram and the next time 4 grams while it is all powder! The same happens with the 1 tbsp …there are diffrences too. And 1 more question….are you really sure that 3 cups flour makes only 363 grams?Cos in totall of 2 cups sugar is already 417 grams! Mayby i missunderstood since english’s not my speaking language. And we only use grams, no cups or tsp or tbsp! Mayby i’m mistaken that way, but will you please explain to me? Thank you very much in advance!! Hi Marja, the most accurate way to measure your ingredients is by weight, as you are used to. The measurements in the recipe are correct. Ingredients weigh differently. For instance, a cup of sugar is heavier than a cup of flour, which is why you see a difference in gram weight despite the cup or teaspoon measurement being the same. This recipe looks divine!! Wondering if it can be made into a bundt pan? Hi Glenda, You should be able to make this in a bundt pan with no problem. The recipe makes 8 cups batter….fill the bundt pan 2/3’s full. Depending on the size of your pan, you might have leftover batter for a few cupcakes. Hi! We loved the flavour of the cake, lovely recipe! I substituted molasses for golden syrup and it was lovely and fluffy. The buttercream was too runny, I added extra icing but did not get the right consistency still, LOVELY!! See resulta. Hi Tebogo, I have not tried that with this recipe but I think you could do so with no problem. Did you guys change this recipe? I was double checking the instructions, and I realized there was no longer brown sugar in the ingredients like I have written down. @JadesRevenge- Hello! Yes, we did make some changes to this recipe last month based on feedback that we were getting. Although everyone loved the flavor, sometimes people had trouble with the layers sinking a little after taking out of the oven. 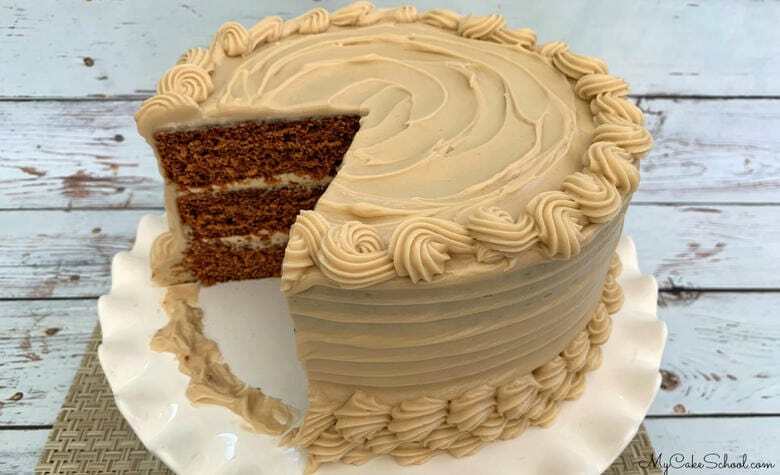 When we made our Gingerbread Latte Cake last month, we decided to revamp the original gingerbread cake recipe–the flavor is just as good but I think the results are more consistent. Ok, awesome :) I’ll try it the new way! Hi, for the gingerbread cake. If I want to make cupcakes how long would I bake them? What about mini Bundt cakes? Would either of these require an oven temperature change? Hi Deb, For a standard size cupcake, bake at 350 degrees for 18 to 20 minutes. I’m not sure of the size of your mini bundt pan, but if it is the mini bundt pan that makes 6 ……..bake at 350 degrees for 20 to 25 minutes, keep an eye on them. When a toothpick comes out clean or with just a few crumbs attached it is done.